Once upon a time, in the dawn of pre-history – well, 2006, actually – a grayling angler who shall remain nameless, made the mistake of telling Malcolm that there hadn’t been any advances in floating fly fishing since Oliver Kite. For some reason this event was not recorded in The Times, which is surprising, because it rendered Malcolm speechless, something that has never happened before. Clearly something had to give and the result was the wonderful account of what happened next; all I can say is that if you haven’t read it, you should, because it is written with all of Malcolm’s clarity and a generous dash of his rather magical style, spiced up with all the numerous anecdotes we have come to expect from this talented fisherman. 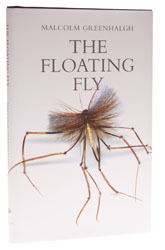 The book begins with a potted history of the floating fly, the origins of which go back far into the dim mists of time. As the author points out, far from being a late 19th century invention, fishing with dry or floating flies (call it what you will) goes back as long as you like, and it didn’t begin an end with Halford’s generation, as some would like to believe. Then we get into the real meat of the story: much of the progress since Halford’s day has been driven by new materials and new technologies, which have allowed great leaps to occur. Plasticized fly lines are the most obvious example, but carbon fibre rods have revolutionised casting and man-made fibres allow us to tie flies that can’t sink; the list is pretty much endless. Needless to say, discussion of fly patterns takes up the bulk of the book and the author highlights dozens of highly effective styles of tying that have evolved since Oliver Kite’s day, chief among them being the modern concentration on emerger patterns. Would Oliver be shocked by this? I don’t think so – had he lived, he would be right on the cutting edge of fly tying today. A great book, real food for thought, full of good advice and fine stories. Just get it.